1. Imports are up 20 percent. For the second year in a row, primate imports into the United States have increased. And not just a little bit. In 2014, the United States imported about 4,000 more primates than in 2013. That’s 23,465 monkeys and apes—as opposed to 19,466 in 2013 and 17,488 in 2012. Long-tailed macaques like this one were again the most commonly imported primate into the U.S.
2. We know less about the trade this year than we did last year. Due to changes at the U.S. Fish and Wildlife Service, we suddenly are not being granted access to any information about the identity of foreign exporters when we request this data. In the past few years, we have been able to determine that business like the Guangxi Weimei Bio-Tech Co., Ltd., Huazheng Laboratory Animal Breeding Center, Guangzhou Blooming Spring Biological Technology Development, and Bioculture Mauritius, Ltd., have frequently been among the top five exporters. This reflects a grim trend in which primate trade information is becoming more and more restricted. For example, back in the 1990s, it used to be possible to learn the “declared value” of each primate shipment, but that information has not been available for 15 years. 3. Long-tailed macaque monkeys are still the Number 1 import. This is especially bad news, in that most of these animals were destined for all-too-short lives in laboratories. 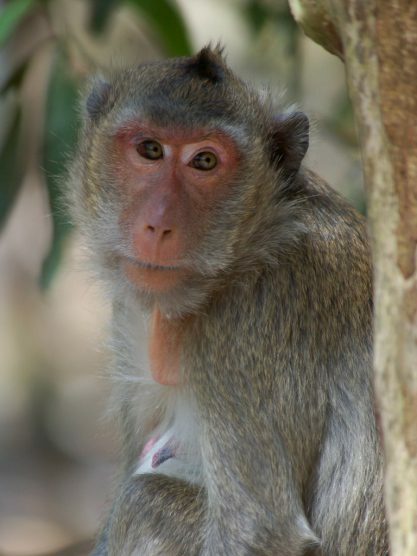 This monkey species (also known as the long-tailed macaque, cynomolgus monkey, or Macaca fascicularis) has become the favored lab primate, having long ago replaced the rhesus macaque. Note that, once again, almost no apes were imported: just one gorilla and one Sumatran orangutan, both destined for zoos (in Dallas and Indianapolis, respectively). Apart from three prosimian primates, the rest of the imports were all monkeys. If you are interested in more of this data, please contact the IPPL office (info@ippl.org). It seems to me that the U.S. government is protecting information that should be open for all. I believe that a corporation is not “a person” and therefore a corporation’s information should be available to all interested, especially with the escalations of the import on non-human primates. Great job compiling and publishing all of this data! Thank you, Brian; I just wish the results were more encouraging! I agree with Brian. I appreciate your efforts in collecting this data and reporting on it.